This article was edited from wikipedia: Indonesia has a long history of stone, bronze and Iron Ages expressions. The megalithic models can be found in various archeological destinations in Sumatra, Java to Sulawesi. The local Indonesians tribes have their own particular unique tribal model styles, generally made to delineate predecessors, divinities and creatures. The prehindu-Budhist and preislamic models can be followed in the works of art of indigenous Indonesian tribes. The most prominent models are those of Asmat wooden figure of Papua, the Dayak wooden veil and model, the genealogical wooden statue of Toraja, additionally the totem-like figure of Batak and Nias tribe. The stone figure artistic expression especially thrived in eighth to-tenth century Java and Bali, which show the impacts of Hindu-Buddhist society, both as stand-alone masterpieces furthermore fused into sanctuaries. Most remarkable figure of established Hindu-Buddhist time of Indonesia are the many meters of alleviation and several stone buddhas at the sanctuary of Borobudur in focal Java. More or less two miles of impeccable easing model recount the story of the life of Buddha and delineate his teachings. The sanctuary was initially home to 504 statues of the situated Buddha. This site, as with others in focal Java, demonstrate an acceptable Indian impact. The samples of remarkable Indonesian Hindu-Buddhist models are; the statues of Hindu gods; Shiva, Vishnu, Brahma, Durga, Ganesha and Agastya enthroned in rooms of Prambanan sanctuaries, the Vishnu mounting Garuda statue of lord Airlangga, the flawless statue of Eastern Javanese Prajnaparamita and 3.7 meters tall Dvarapala dated from Singhasari period, furthermore the fantastic statue of Bhairava Adityawarman found in Sumatra. Today, the Hindu-Buddhist style stone figures are recreated in towns in Muntilan close Borobudur additionally in Trowulan the previous capital site of Majapahit in East Java, and Bali, and sold as enclosure or pool adornment statues for homes, work places and inns. 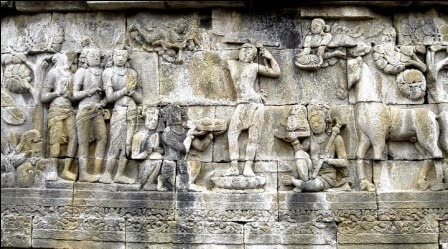 0 Response to "Easing model Relief Sculpture from Borobudur Temple"